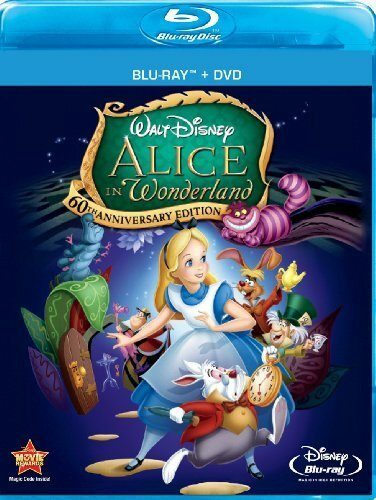 Alice In Wonderland (Two-Disc 60th Anniversary Blu-ray/DVD Combo) Only $14.29 (Reg. $30.55)! You are here: Home / Great Deals / Amazon Deals / Alice In Wonderland (Two-Disc 60th Anniversary Blu-ray/DVD Combo) Only $14.29 (Reg. $30.55)! Check out this great Amazon deal! Right now you can get this fun nad highly-rated Alice In Wonderland (Two-Disc 60th Anniversary Blu-ray/DVD Combo) for only $14.29! This classic movie is perfect for any collection. Experience the magic and majesty of Alice In Wonderland with the ultimate collector’s dream. For the first time, Walt Disney’s timeless classic bursts into brilliance in Blu-ray Hi Definition! Featuring Disney Enhanced Home Theater Mix, this remarkable digital restoration boasts pristine sound and unparalleled picture quality. Plus, fascinating bonus features including “Through The Keyhole: A Companion’s Guide To Wonderland” and an exciting interactive game, “Painting The Roses Red”, have been specifically designed for this landmark release. Join Alice as she chases the White Rabbit and journeys into a topsy-turvy world that gets “curiouser and curiouser” as her fantastical adventures unfold. Meet the Mad Hatter, March Hare, Tweedledee & Tweedledum, the Cheshire Cat, the Queen of Hearts and more unforgettable characters, all set against a backdrop of awe-inspiring splendor. Filled with spectacular songs and animation, this 2-disc 60th Anniversary celebration of Alice In Wonderland is more wondrous than you ever could have imagined!